There are numerous reasons why so many people visit Krakow. On the one hand, it has plenty of amazing historical monuments and high-class museums, on the other hand it’s a place where you can have fun and party all night. People from each age group and each environment are more than welcome to visit Krakow. Yet, there is one thing that EVERYONE would like to visit Krakow for. It’s the traditional Polish cuisine that attracts the whole world! 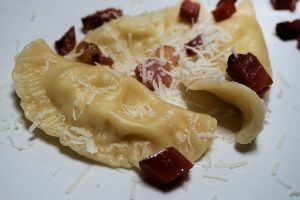 Delicious and unique traditional Polish food can be found in the best Krakow restaurants in each district. In fact, you can spend your whole stay in the city on discovering it’s amazing tastes! 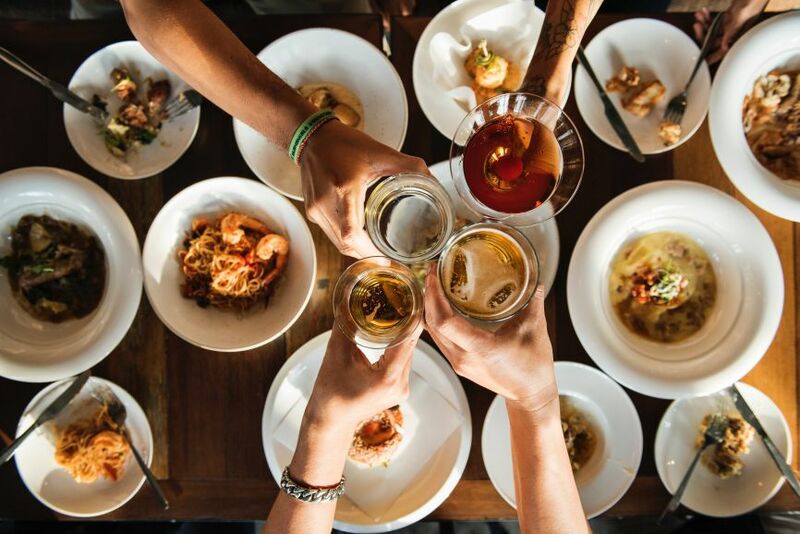 So, have you already tried all of the best specialties of Polish cuisine? Check out what else you have to try if you visit Krakow. Absolutely everybody must try them while visiting Poland, that’s for sure. The question is – what taste will you choose? Those with cheese and potatoes, buckwheat groats, cabbage and mushrooms, meat or spinach topped with butter? How about pierogi with strawberries or blueberries topped with cream? Fine pastry filled with various stuffing it’s among obligatory Polish dishes in every restaurant in Krakow. It’s another representative among best Polish dishes with an old tradition. It literally means “pigeons” but it has nothing to do with the birds! 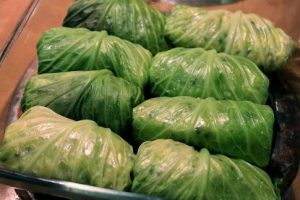 It consists of cooked white cabbage leafs wrapped around various fillings. The most popular ones in Polish cuisine are with mincemeat and rice or groat (also vegetarian options), often mixed with onion, garlic and mushrooms. Cabbage rolls are served with home-made tomato sauce in best Krakow restaurants as well as in simple milk bars. Hunter’s stew is very easy to make and its taste is a perfect mix of different flavors. Polish bigos is anything but minced cabbage stewed with different types of meats, mushrooms and onion. Various seasoning including pepper, caraway seeds and allspice add an ultimate taste to this meal. What’s more, bigos gets even more tasty if you reheat it several times. It’s one of the most popular Polish dishes for sure and you cannot miss the opportunity to try it in Krakow. Golonka (pork knuckle) – are you hungry for real? Golonka is one of the traditional Polish dishes dedicated for those with a hearty appetite. It’s a fare chunk of pork leg boiled in a water with various seasoning and vegetables. It’s traditionally served with sauerkraut, horseradish and baked potatoes. However, there are slightly different versions of golonka in different parts of Poland. For example, in the area of Beskid Śląski, golonka is traditionally stewed in beer. So, are you ready to get o grips with a portion of this filling meat Polish traditions? 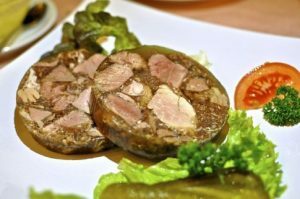 Koptyka – have you ever eaten hooves? Polish word “kopytka” literally means “little hooves” due to its characteristic shape. This traditional Polish dish is a combination of potatoes, flour, eggs and salt, kneaded, cut and boiled. Their delicious, exquisite taste is perfectly filled by butter or mushroom topping. Kopytka can be served as an separate meal or as a side dish for different meats or a stew. You should easily find kopytka in every milk bar or restaurant in Krakow. It’s another position among traditional Polish dishes, that could seem a little bit… strange. Nevertheless, it’s absolutely delicious! Poultry, fish or vegetables, served in a specific form of jelly is very popular meal of Polish cuisine. It’s served during every Polish traditional wedding or family gathering. Some may be unconvinced of galaretka, especially because of to jelly-like consistence. However, its taste completely makes up for it’s appearance – see for yourself! 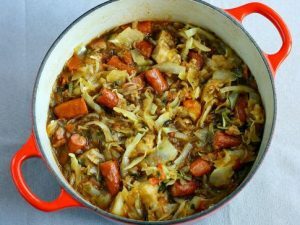 This delicious Polish soup it’s a favorite in Polish cuisine as everybody loves żurek! It’s made of sour rye flour with an addition of Polish kielbasa, eggs and some vegetables. There is one principle if it’s about components inside your żurek – the more, the better. You’ll find this Polish soup it in the best Krakow restaurants and traditional houses as well. 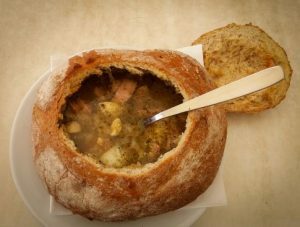 Sometimes it is often served in a very specific bowl – it’s edible as well as it’s entirely made of bread! This amazing soup will make you feel warmed up, sated and simply happy. Chicken broth is definitely in the first flight of Polish cuisine and you can find in every restaurant in Krakow. A proper preparation of rosół is quite time-consuming as you need to boil a meat (usually poultry) with soup greens for a long time. However, it’s definitely worth to wait and relish this one of the best Polish soup. 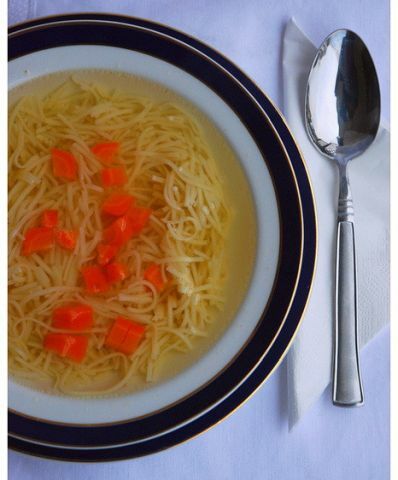 It is usually served with carrots, parsley or celery. It’s one of the most specific traditional Polish dishes. In fact, it has both supporters and opponents, as is very atypical meal. It’s one of the most recognizable Polish soup for sure. 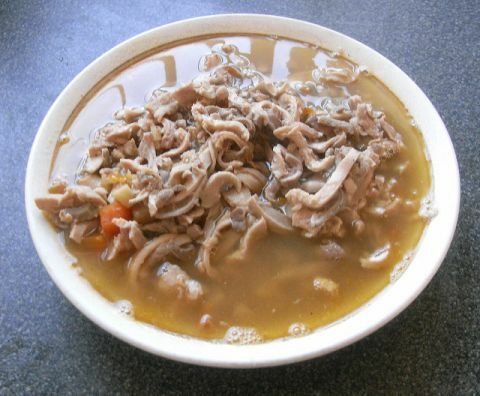 Tripe soup is also a part and parcel of Polish traditional weddings and family gatherings. It’s made with cleaned strips of beet trips and topped with spicy seasoning. 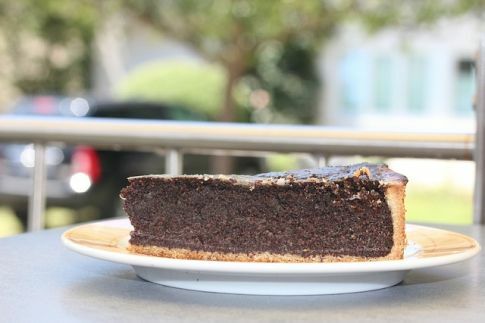 Probably not everybody will decide to try flaki but one thing is sure – its taste is ultimate. 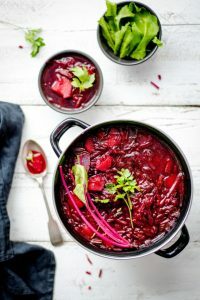 This colorful Polish soup made of beetroot is an obligatory dish (and the first one) during Christmas period. In fact, no borsht – no real Christmas dinner! 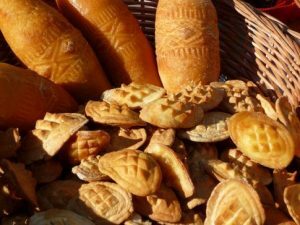 It’s traditionally served with uszka which literally means little ears due to their shapes. Stuffed with cabbage and mushrooms, uszka perfectly compound with sour taste of Borscht. According to Polish traditions, you should put a little coin inside one of them. If you find the coin during Christmas dinner in your uszko – soon you’ll be rich! 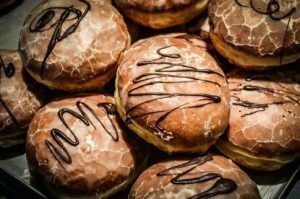 It’s hard to say what’s the best part of Polish doughnuts: weather its perfect, fine yeast dough, its sweet, running filling or its incredible smell. There are plenty of different tastes of pączek that you can buy in Krakow today: caramel, chocolate, liqueur, pudding or even quark. However, the traditional Polish pączek is filled with rose marmalade and sprinkled with caster sugar. 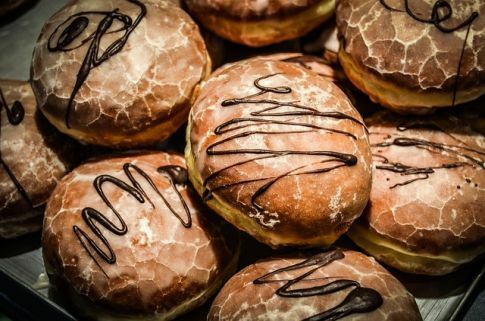 If you visit Krakow on Fat Thursday, you’ll see millions of doughnuts in every shop and a real doughnut madness among the citizens. Nevertheless, if it’s not the Fat Thursday, you can always prepare for it by facing the challenge – how many pączek can you eat one day? It’s a traditional cake, usually served during Christmas and Easter period. Preparing home-made poppy-seed pulp is time-consuming, as you need to grind it several times. However, the effect is rewarding. The pulp is either put on a shortcrust pastry, or wrapped into a yeast dough which gives it unique shape of a spiral. Topped with candied orange peel and frosting or chocolate constitute a real gourmet meal in Polish cuisine. You can also add some dried fruits and nuts to make a perfect makowiec for yourself. 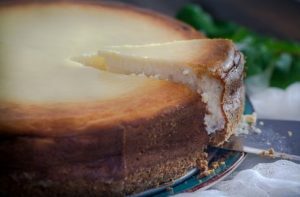 Although cheese cakes are popular around the world, the one that is prepared according to Polish traditions, has an ultimate taste. The secret resides in a high-quality cheese – fresh and fat quark. First of all, you need to mince it several times to make a perfect consistency. In fact, if you do it properly, the cheese cake doesn’t need any additions at all! The effect after baking should be amazing – incredibly fine texture will make you feel like in heaven. 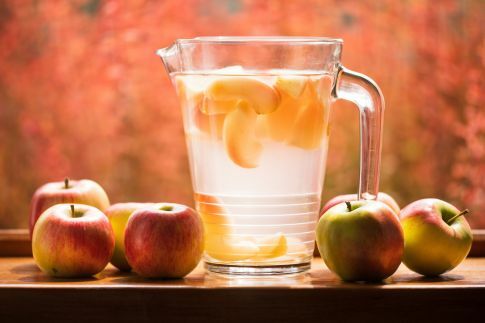 You can prepare this refreshing beverage according to a very simple recipe of Polish cuisine. Just take some fresh fruits and boil them with an addition of cinnamon, cloves or some favorite seasoning. Compote can be made with various fruits including apples, cherries, currant, pears, rhubarb, strawberries – it’s up to your imagination! According to Christmas Polish traditions, compote is made from dried fruits. It’s served during Christmas Eve as one out of 12 traditional Christmas Polish dishes. Piwo has been present in Polish traditions for over a thousand years and has significantly rich history. It’s been a favorite alcoholic beverage of Slavs for ages. Well, it still is for many of them. Our Polish beer culture offers variety of brands and local breweries from different parts of Poland. 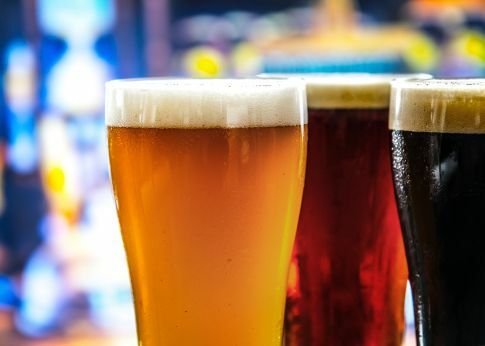 Wheat, dark, lager, porter or pilsner beer – which one is your favorite? If you visit Krakow, don’t miss the opportunity to try a local beer called “Krakowiak“. However, remember what they say – there’s not such thing as “going for one beer” in Krakow! It’s production dates back to early Middle Ages and is considered to be traditional Polish drink. 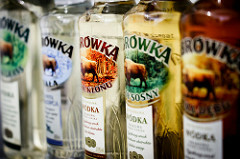 There are pure vodkas or flavored ones including bison grass vodka, anisette, krupnik (vodka with honey), cherry, lemon or pepper vodka and many many more…If you visit Krakow, probably you won’t avoid drinking vodka shots in the middle of the night. They say that it’s a real challenge to drink with Polish people – do you think the same? Famous oscypek is a traditional smoked cheese from the South of Poland (especially Podhale), but is popular all over the country. You can buy it in Krakow as well – either in supermarkets or from some stalls in downtown. There are different shapes and types of oscypek – made of cow, goat or sheep milk. It’s quite salty and often served grilled with bacon or with cranberry. 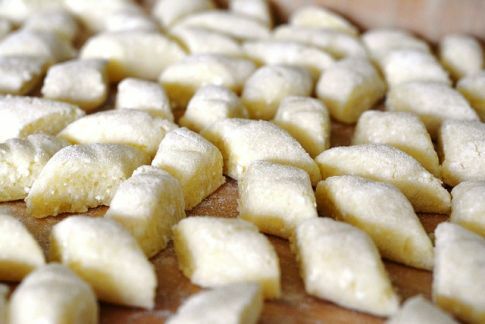 The best place to try this unique salty cheese is Zakopane – very popular city among those who visit Krakow. Polish sausages are definitely at the forefront of traditional Polish food. They are a part and parcel of every Polish table and are very popular among people from around the world as well. There are plenty of Polish sausage varieties: fresh or smoked, made with beef, pork, lamb, chicken, turkey or veal. Additionally, each region of Poland has its own specialty. The one from Krakow (krakowska sausage), usually comes with pepper and garlic. 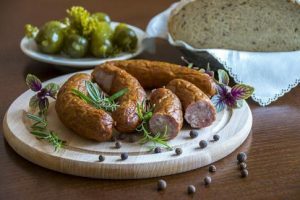 People in Poland usually eat kielbasa with pickled cucumbers and fresh bread with butter or lard. Pickled cucumbers are definitely a staple of Polish cuisine. You can buy it in every grocery shop or supermarket in a jar or even in a traditional barrel. What’s more, probably every Polish grandma has a collection of jars of preserves in her cellar. 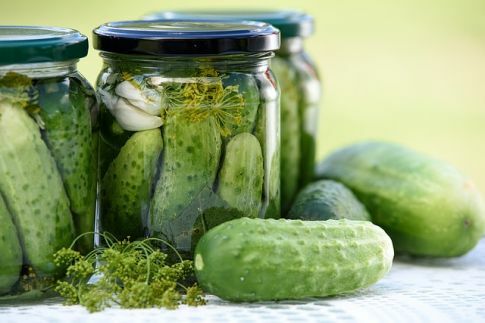 There are three main types of pickled cucumbers in Polish traditions: sour ones, low-salt ones and sweet ones. It’s specific taste perfectly mixes with Polish kielbasa and a shot of vodka. Additionally, A jar with pickled cucumbers is one of the most characteristic gifts you can bring home from Poland! This perfect combination of alcohol and sweetness is made of fermented honey. Additions can be various – orange, cinnamon, cloves, ginger, mint… There are different types of mead – some can have 3,5% and some even up to 20 %. What’s more, it is said that mead will cure all your illnesses. According to Polish traditions, it’s usually served in a glass or a stoneware cup and is a perfect addition to your lunch or supper. Poles also like to drink mulled mead, especially during the wintertime – there’s no better way to warm yourself up! Our company offers several tours from Krakow that will familiarize you with traditional Polish food and drinks. 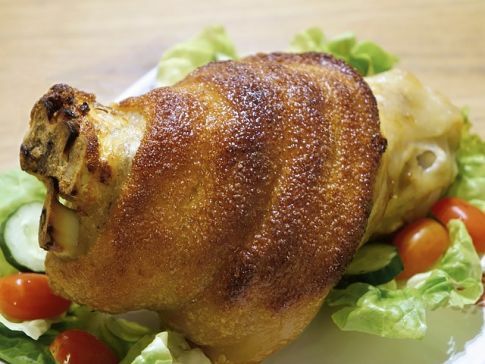 Explore best Polish dishes around a wooden table in traditional Polish restaurant. What’s more, your dinner will be accompanied by a folk show performed by professional dancers. Prepare for amazing journey through the finest food and ultimate Polish traditions. Don’t wait and book a Folk Show tour today! How about discovering a long history and Polish traditions of Tyskie brewery? 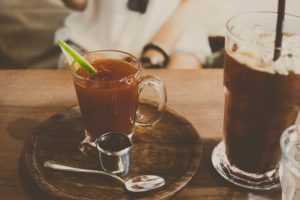 See how this popular beer is made according to the traditional Polish recipe on our Tyskie Brewery Tour. 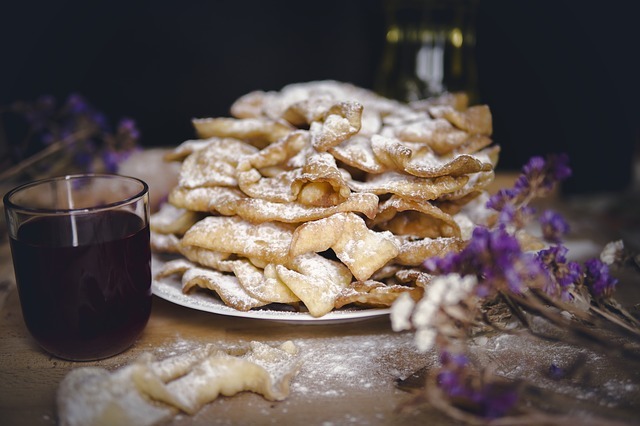 Discover incredible tastes of the famous Polish region – Podhale along with Zakopane. We will take you to the city, where the finest Polish kielbasa or cheese are produced. Book our transfer to Zakopane and begin your culinary trip through traditional Polish food. Dear Joanna, I am writing on behalf of the four of us to thank you for dealing with our arrangements which were perfect in every way and which enhanced our stay. You have at all times been very helpful and professional for which we are very grateful. I would also like to mention Lukasz Bunsch our driver and guide on Thursday, Friday and Saturday. An excellent driver, always on time, always with a smile, always helpful he made a major contribution towards the enjoyment of our stay. As you know this was my second visit to Krakow in 18 months and I used Krakow Direct again having had an excellent experience with your company last time, as we have enjoyed this time. I would not hesitate to recommend you and Krakow Direct. My thanks to all of you, in particular you and Lukasz. Best wishes from the UK.